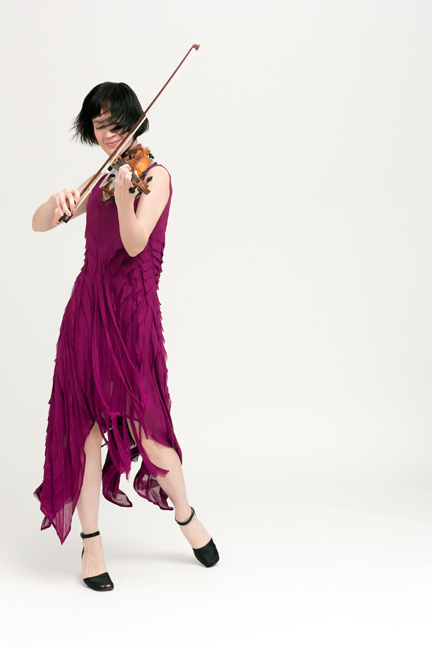 NEW YORK – Violinist Miranda Cuckson is one of the stars of new music in New York: a fearless, visionary, and tremendously talented artist. On March 7th, she presented a solo program of 20th and 21st century works in a “Pop Up Concert” at Columbia University’s Miller Theatre. In her introduction to the event, Miller Theatre’s Executive Director Melissa Smey pointed out that their “Pop Up Series” has hosted dozens of world and New York premieres. Cuckson’s program was no exception, leading off with the New York premiere of En Soi (2017) composed by Steve Lehman, a Columbia alumnus who is now on the faculty of CalArts. It is a very strong piece, written with a bevy of plucked passages using both hands. This is designed to make the violin resemble an African instrument called the ngoni. To further cement this association, Lehman specified a microtonal tuning and scordatura. Accordingly, Cuckson performed En Soi with one violin and the rest of the program with another. Two pieces by Aaron Jay Kernis followed. Both showed the Pulitzer prize winner’s absolute command of idiomatic writing for strings. Aria-Lament (1992) departs from an introduction filled with soft altissimo passages to a gradual buildup of energy in the main section, incorporating meaty double stops and angular allegro melodic lines. A Dance of Life (2010) juxtaposes fast moving chromatic passages with ruminative sections of achingly sustained lines. Cuckson has performed a great deal of Michael Hersch’s music. A recent work composed specifically for her, the weather and landscape are on our side (2016), demonstrated the composer’s keen affinity for Cuckson’s capabilities. A multi-movement work, it features numerous delicate passages, employing bowing techniques, pizzicato, and harmonics to differentiate gestures. All was not introversion however, as the piece also accorded the violinist dynamic sections which burst forth in eruptive fashion. The concert culminated with Huang Ruo’s Four Fragments (2006), pieces requiring considerable virtuosity that use sliding tones and melodic patterns from traditional Chinese music. The frequent resemblance to vocalisms from Chinese opera were striking. The Fragments were a thrilling way to end the concert. Cuckson is an ideal emissary for contemporary music. Assaying a formidable program, her preparation was exquisite and presentation consistently engaging. Miller has more “Pop Up” events in the Spring, including performances by the Orlando Consort, ICE, Ensemble Signal, JACK, and Mivos Quartet. The price can’t be beat – free – and one can even enjoy a libation to boot.